Shennecossett Yacht Club’s First Annual Lighthouse Regatta on August 2 will honor the memory of Bruce Lockwood of Groton Long Point, CT, a distinguished racer on Long Island Sound and many other venues. The Bruce Lockwood Cup, a perpetual trophy, will be presented to the boat in the spinnaker fleet with the best corrected time. Bruce was an avid and enthusiastic competitor, involved in racing his entire life. He grew up on Long Island Sound and belonged to many sailing organizations including Shennecossett Yacht Club (serving as Commodore 1986-1988), Ram Island Yacht Club, Baldwin Yacht Club, Off Soundings Club, Storm Trysail Club, Woodbridge Association, and the Mystic River Mudhead Sailing Association. He won Key West Race Week, three Block Island Race Weeks, the Mumm 30 Northeast Championship, was the top boat in the Mudhead Fleet eight times, and was victorious in too many Off Soundings series to count; the last one in 2012, just four weeks before he died at age 90. 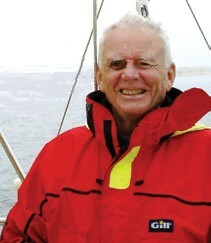 In addition, he raced his boat to Bermuda and even participated in the Transatlantic Challenge in 2005 at the age of 83. Many sailors on Long Island Sound have been inspired by Bruce as they witnessed his enthusiasm and skill on a series of sailboats including his J/36 Arrow, J/29 Tomahawk, and Farr 30 One More Time. A new Arrow, a 9-foot Dyer Dhow donated by family and friends, has joined the fleet at Mystic Seaport in Bruce’s memory. All racers are invited to participate in the Lighthouse Regatta to honor Bruce by the awarding of the trophy in his name. Cruising sailors may sign up for a non-spinnaker class with PHRF numbers assigned by the race committee. The course in Fishers Island Sound will be within view of many historic lighthouses, a unique concentration of nine in a small geographic area. Proceeds from this Eastern Connecticut Sailing Association event will be donated to the New London Maritime Society’s Lighthouse fund. Visit syc-ct.com for more information.